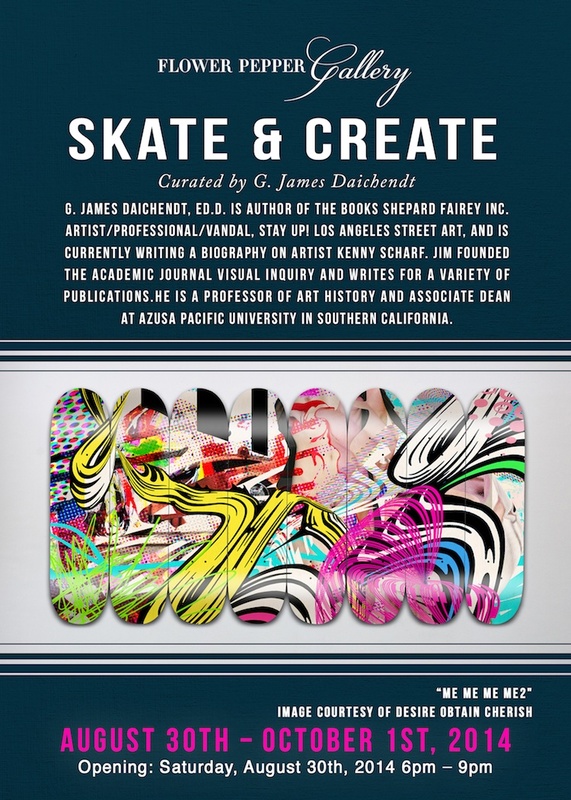 The skateboard culture of Southern California played a seminal role in the early influences of many graffiti and street artists. The growth of the sport, or anti-sport, along with its strong visual component, represented a renegade vigilante attitude, like punk and while every skater was not a criminal, the graphics on the boards often abused copyright or represented darker and more anti-authoritarian attitudes. This exhibition of street art and street inspired graphics symbolizes these rich origins and pushes forward a new generation of sleek, cool, fun, and taboo imagery on skate decks that epitomizes both sub-cultures. 2wenty, Bandit, Benjamin Alejandro, Blinky, Bleep Bloop, Bumblebee, Cali Killa, Common Cents, Cindy Love, David Flores, Desire Obtain Cherish, Earl Lee, Egads, Felix, Gianni Arone, Greg Auerbach, Haunted Euth, Homo Riot, Insurgency Inc, Jason Ostro, Jennifer Korsen, Kenny Scharf, KH No. 7, Kiosk, Koffinz, Little Ricky, Mad Man, Mar, Morley, Me, Phobik, Random Act, Risk, Sand One, Sek, Septerhed, Shadow Monster Bear, Shepard Fairey, Skechy, Smear, Sprouts, Teacher, The $tatus Faction, Thrashbird, TFail, War n Buff it, XVLA, plus a few surprises!